The Story of our Two New Di Bruno Bros. 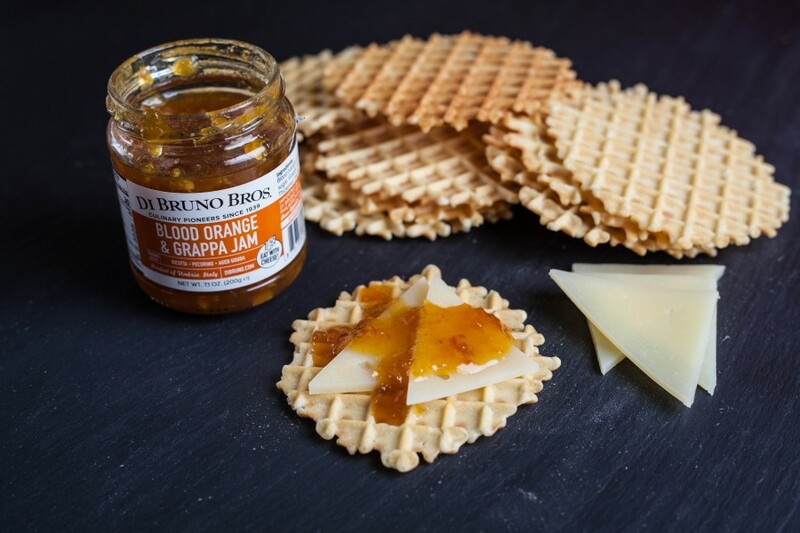 Jams - Strawberry Prosecco and Orange Grappa | Blog | Di Bruno Bros.
Posted October 30, 2017 by Di Bruno Bros.
Our DB Private Label Jams, and other Private Label (meaning the things with our logo on them) products have all been specially sourced and designed by our own third generation owner Emilio Mignucci and other employees close to the heart of our organization. 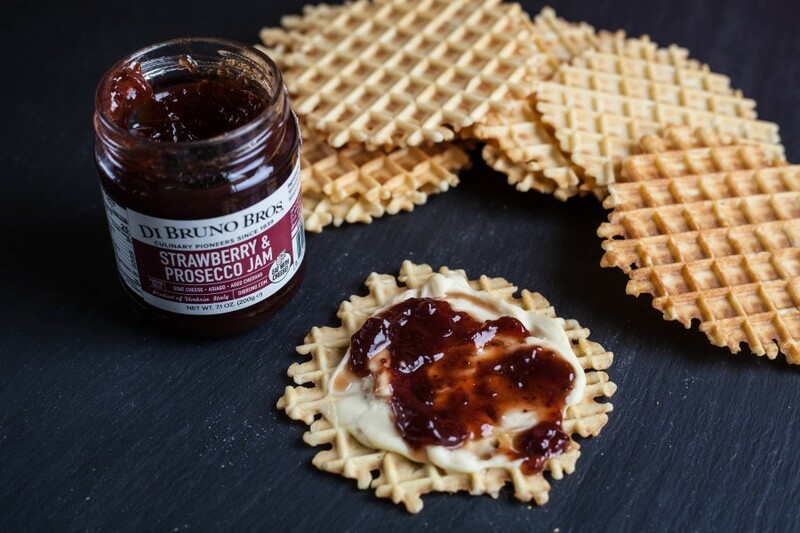 In celebration of the two newest additions to our private label line – Strawberry Prosecco Jam and Blood Orange & Grappa Jam – we asked our Procurement Manager Scott Case to describe how these two flavors came to be. Luigi is Roman, but he moved to this feral place in order to hunt for truffles and to open a tiny agriturismo in the hills of Val Nerina. Luigi would make jams for his guests that they clamored for – he soon realized that this could be a career, and eventually closed the agriturismo and opened Athenor as a full time jam, jelly and savory condiment company. Over the years, he’s scaled up, but he still maintains a small staff of dedicated employees – Claudia, the glue of the operation who manages the office, the aforementioned Jacopo, a jack of all trades, and Sonia, Luigi’s fiancée and plant manager extraordinaire. Luigi loves a good challenge, and relished our challenge. We ate an epic lunch high up in the hills, and talked about food, while brainstorming ideas for our jams. Within a few months of returning to Philadelphia, Luigi had sent several concoctions for us to tastes. There were some weird ones – Beer Jelly, Pumpkin Jam with Amaretto (and amaretti cookie pieces), Fig Jam with Norcino (a walnut liquer). 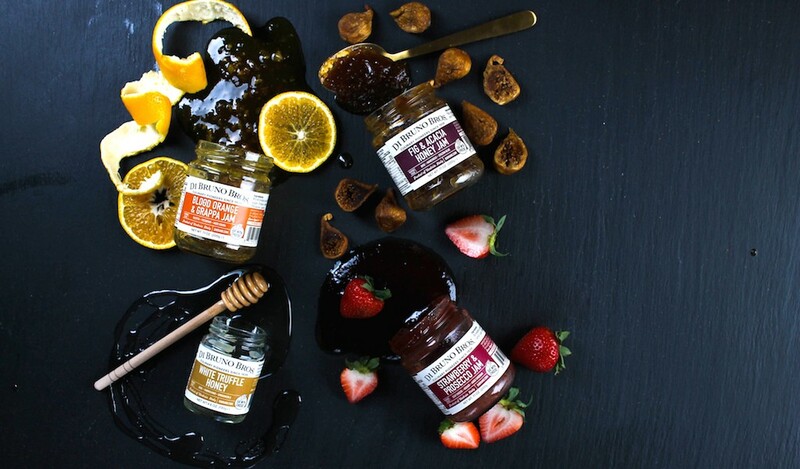 From this lot, there were two clear winners – both from flavor profile, and what we thought our customers would be ready for and love: Strawberry and Prosecco Jam and Blood Orange and Grappa Jam. The flavors were great, then it was off to the marketing team to design the labels for these new jams. After several rounds of redesigns, we agreed on the final version, one that would include some well-tested cheese combinations with the two new condiments. Which takes us to now, and the jam that you are currently holding in your hand! Not actually holding these jams in palm yet, but looking to? Head right over to DiBruno.com to order, or stop by your nearest retail store!